In the entourage of Swedish Princess Cecelia, Elin von Snakenborg arrives in Elizabethan England after a harrowing months-long voyage, unsure about her future when she finds her dowry and her fiancés affections usurped. However dim her prospects, she shines at court with her quick wit and unflagging devotion to her mistress—qualities not lost on England’s formidable monarch. When the time comes for the Sweds to move on, Elin is asked to stay, for she had captured the eye of a marquis and the respect of the Queen of England. Elin became Helena, Marchioness of Northampton—the second lady in the land. Privileged as she may have become, she was also confined in many ways, with the Queen’s wishes always priority and political intrigue ever lurking in the shadows. With her family life perpetually in the background, she constantly questions whether perhaps her happiness is to be found outside of court life. Though fiercely loyal to the queen and ever intent on serving her, Elin eventually finds herself inadvertently caught in a plot to overthrow Elizabeth and place the Catholic Mary, Queen of Scots on the throne. She realizes she must delicately extricate herself for the future of her family and her queen, though perhaps to the detriment of her beloved husband. 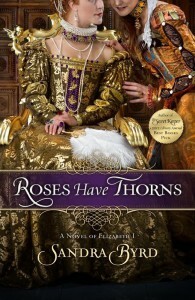 This is the third in a series of “Ladies in Waiting” to Tudor queens by Sandra Byrd and I have enjoyed each one. Not many authors can present fleshed-out characters inside the very first chapter, but this is the case with Elin. She is even more interesting because she was in fact a real person, married to the brother of Henry VIII’s last wife, Catherine Parr. I enjoyed reading the parallels between this novel and the author’s previous book, The Secret Keeper, which features a young lady close to Catherine. I recommend this book to Tudor enthusiasts and even those thoroughly over-read in the era, as the interesting Swedish protagonist brings a fresh perspective to the genre.